With the Rockets struggling early this season, can anyone else emerge to replace Houston as the clear runner-up to Golden State? 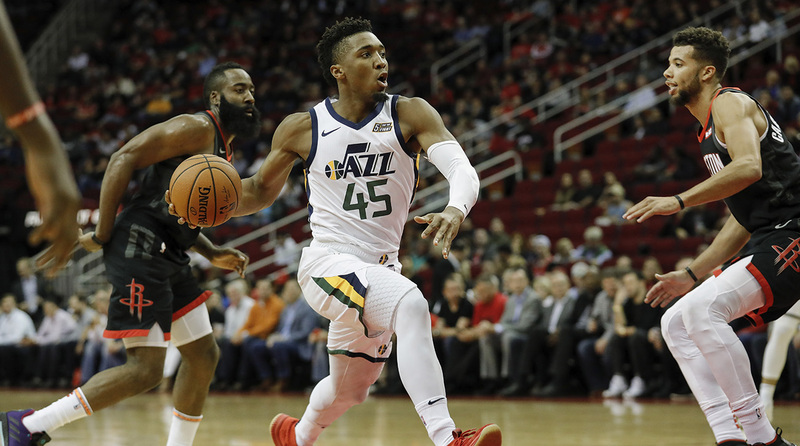 For the Jazz to contend, they will need second year star Donovan Mitchell to take the next step in his transformation. 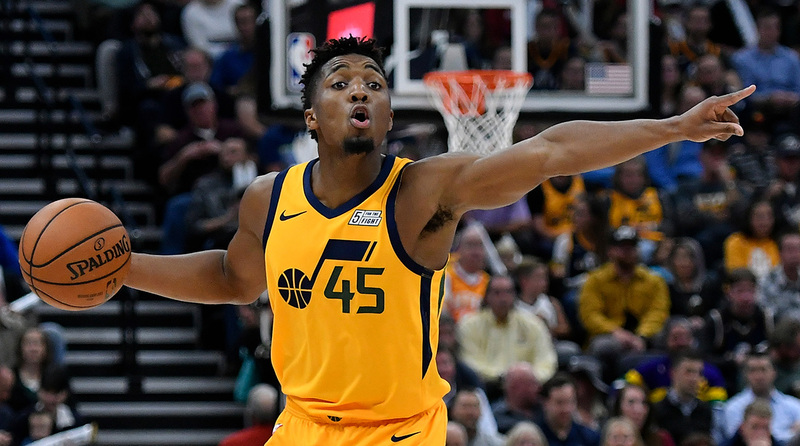 The Jazz want to go from good to great this season, and that will only happen if Donovan Mitchell can make the same transformation. Wednesday night, Mitchell's performance against the Rockets (38 points, 7 assists) was a very good start. Almost exactly a year ago, the Jazz were one of the best surprises in the NBA. Ricky Rubio had been rejuvenated out of nowhere, Donovan Mitchell's summer league success was translating to real games, and Utah began the season at 5-3, including wins over the playoff-bound Thunder and Blazers. I wrote about all this as it happened. No one could tell how real these developments were, and everyone agreed that the early success probably wouldn't be sustainable, but that was fine. At the time, and after an offseason in which Gordon Hayward signed with Boston and left Utah with nothing, a little bit of hope was a big win for the Jazz. Of course, as everyone knows now, what actually happened last season was even crazier. First, the Jazz followed that early success by losing 18 of 25 games from December 1st to January 22th. That was the reality check, and the regression that most people worried about during those first few weeks. Sitting 9 games under .500 in mid-January, it looked like Utah would have the 10th place season that everyone had expected all along. From there, the team finished the year winning 29 of their final 35 games. Utah finished at 48-34 and landed at fifth in place in a loaded Western Conference. Rudy Gobert won Defensive Player of the Year. Quin Snyder probably should've won Coach of the Year. Mitchell nearly stole Rookie of the Year from Ben Simmons. In the first round of the playoffs, the rookie went head-to-head with Russell Westbrook and outplayed him over the course of five games. The Jazz advanced, and while they lost decisively to the Rockets in the West semis, the future looked brighter than it ever had with Hayward. Utah entered this season with a real chance to be one of the best teams in the entire league. That brings us to Wednesday in Houston, where the Jazz dismantled the same Rockets team that dominated them a year ago. The win for Utah will come with disclaimers: Chris Paul didn't play; the Rockets are still adjusting to a new rotation; Harden tweaked his hamstring and left the court for several minutes during the fourth quarter; it's October. Ultimately, there are really only two takeaways that matter after Wednesday night. First of all, the Rockets have real issues to work through. It's fine if anyone wants to put an asterisk next to Utah's win Wednesday and remind people that the Jazz weren't exactly beating the same Houston team that they faced last May, but what's interesting is that there's not necessarily a guarantee that 65-win Rockets team is ever coming back this year. The whole rotation looked a step slow Wednesday, and that's how Houston has looked all season. The Rockets are 1-3 and their only win came against an equally dysfunctional Lakers team. There will certainly be room for them to retool as the season unfolds and they will be a tough out by the time the playoffs arrive, but where last season's Western Conference was very much "two great teams and everyone else", the dynamics seem to be a little different this year. The question is whether anyone else will emerge to replace Houston as the clear runner-up to Golden State. That second team in the West should be Utah. On Friday of last week, in the second game of the year, the Jazz went to the wire with the Warriors in what may have been the best game of the season thus far. Joe Ingles was out of his mind (27 points, 10-15 FG, 7-11 3FG) and the Warriors had to battle back from a 12-point halftime hole. Golden State ultimately survived, but it took an elite defensive fourth quarter from Draymond Green, 38 points from Kevin Durant, 31 from Steph Curry, and a buzzer-beating tip-in from Jonas Jerebko to seal the 124-123 victory. The Jazz have probably graduated beyond moral victories, but Warriors games may be the exception. It's a good sign that Utah could push them, and maybe even more encouraging, the Warriors respected the Jazz enough to fight back and send a statement with the win. One thing that was less encouraging was Mitchell's performance down the stretch. With both Utah and Golden State trading buckets for basically the entire fourth quarter, Mitchell was scoreless and 0-7 from the floor through the fourth. He was either trying to do too much, or he was marginalized in the corner while overmatched teammates tried to take over instead. Ingles was unconscious enough to make that strategy (almost) work, but the end of that game underscored how critical Mitchell will be to anything the Jazz want to do against the best teams in the league. Rudy Gobert is incredible defensively, Snyder is a great coach, players like Ingles are fantastic role players, and all of these factors will give Utah a chance against every team in the league. But Mitchell is the guy who'll have to close. Wednesday in Houston, he did. Mitchell had 20 points in the first half, and then he opened the second half turning the Rockets inside. There was a spin move that turned into a pinpoint cross-court pass for an Ingles three; then there was him winding his way around James Harden and then splitting Clint Capela and Carmelo Anthony for an up-and-under lay-up. On successive possessions in the third he sought out Carmelo in switches and got whatever he wanted. Later, when the Rockets fought their way back into the game and made it a six-point margin, Mitchell squared up over P.J. Tucker for a three to kill any comeback momentum. In a game that included James Harden, Mitchell was the best player on the floor. That was the other Jazz-Rockets takeaway that mattered. All of it had me thinking about last season. In retrospect, so much of last night's hope started with the arrival of Mitchell. It was nice to see Rubio with a beard and (sort of) a jumpshot, but that charm was only going to go far. Conversely, throwing an electric rookie onto a team full of overachieving role players was enough to transform the entire franchise. Instead of trying to get excited about a team that was clearly stuck between contending and rebuilding, everyone could geek out watching Mitchell and wonder what might possible in a few years. That room to dream was important. If nothing else, it was the only proper consolation for a franchise that had done everything right only to be screwed in free agency anyway. As the Utah story accelerates and dreams get bigger now, it's still all about Mitchell. The Jazz want to go from good to great, and that will only happen if Mitchell can make the same transformation. Players like Joe Ingles and Jae Crowder and Derrick Favors are perfect complements, but they can't be the centerpiece. The same is true for Gobert, an All-NBA defensive talent whose offense becomes only marginally useful down the stretch. Gobert is great at keeping this team decent regardless of who's out there with him, but he's not the player who will make them elite. In tight games against good teams, Mitchell has to be the guy. His outside shooting needs to get more reliable than it was a year ago. He needs to carry the offense when things break down. His defense needs to be better than it was at times last year. In general, he needs to transform from a good young player to a young All-Star who can be consistently excellent. It's important to remember how difficult that leap actually is. Mitchell's only played a handful of months in the NBA. It's sort of insane that he's already closing games for a contender and drawing Dwyane Wade comparisons. Even Wade himself has chimed in with his approval. The question for NBA fans is whether all of this is moving a little too quickly, and whether we're going to watch this story get more complicated this season. Against Golden State in that fourth quarter, it certainly seemed like we were headed that direction. In a loss to the Grizzlies Monday, Mitchell was 6-17 from the floor and Utah scored 84 points. Before his 38 points and 7 assists buried the Rockets Wednesday, he was shooting 34% from the field and 27% from three after his first three games. More than almost any star in the league, the story with Mitchell is worth monitoring. We know what to expect from every other great player in the NBA, but Mitchell is a wild card. He has more pressure on him than any young player in the league, but also the best opportunity. The West is wide open after the Warriors, and with five or six challengers on roughly equal footing, Mitchell's progress will be the key to whether the Jazz can separate from themselves the pack and become a fourth great team alongside Boston, Toronto, and Golden State. There's a version of this season in which Mitchell makes his first All-Star Game and becomes the go-to scorer for a young Jazz team that wins 55+ games and finishes right behind the Warriors. He might fail, too. It would be very normal for a second-year player to hit a wall before breaking through a season or two later. That's probably the most reasonable timeline here. But then, if there's anything we learned from the Jazz a year ago, it's that regressions and reality checks are not necessarily permanent. After those first three games and whispers about shooting percentages and a 1-2 start, it's only right that Mitchell came back Wednesday and had a night that made anything seem possible.